It just might be Colorado’s best-kept winter secret. 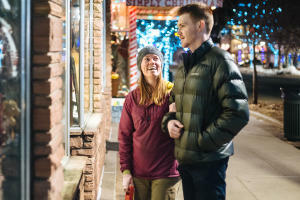 While the rest of the state is battling traffic on I-70 in an attempt to be the first on the slopes, Estes Park – best known for its close proximity to Rocky Mountain National Park – is free of crowds but full of fun. Think of it as your affordable mountain village escape, just a short, scenic drive from Denver and Boulder (and only 90 minutes from Denver International Airport). Over a winter weekend escape, you’ll discover natural beauty, great food, fascinating history, a burgeoning craft beverage scene … and more than a few surprises (sans the crowds). Kick off the weekend with a toast and a tasting at Snowy Peaks Winery, a family-owned boutique winery just a short walk from Estes’s main drag. Snowy Peaks’ handcrafted offerings are made entirely from Colorado-grown grapes, primarily brought in from the state’s famed Western Slope vineyards. Leave your snobbery at the door: the vibe here is relaxed and family-friendly (there’s even a kids&apos; area – the “No Wine-ing Zone”), with live music of the acoustic variety on most Friday evenings. Don’t miss the carefully curated selection of gourmet artisanal Colorado food available for purchase as well. 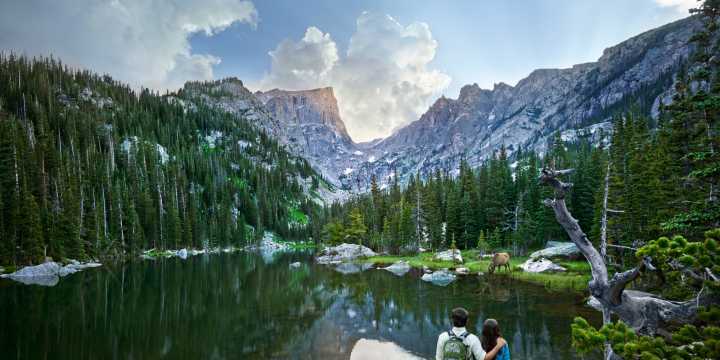 Estes Park is known as a tourist town – but there are plenty of locals worth getting to know. 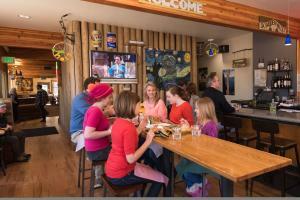 The place where they congregate on a Friday night is Ed’s Cantina & Grill, a lively joint that serves an inspired mix of Mexican and American comfort food, often given a Colorado twist – try the Rocky Mountain Trout, made with corn salsa, black beans, grilled cauliflower, and green chiles. Pair it with Ed’s House Margarita and pretty soon you might be mistaken for a local yourself. When the sun goes down in Estes Park, the sky lights up. And the Estes Park Memorial Observatory offers a chance to check out the moon, the planets, the stars and beyond via a powerful 16-inch Ritchey-Chretien telescope, which is housed in an impressive 16-foot dome. Check the website for open houses, or schedule a private viewing and get ready for some serious stargazing. The observatory is free, although donations are suggested. Your RMNP adventure will leave you with a greater appreciation of the natural world – and a serious appetite. Claire’s On The Park delivers the carbs you’re craving in a cozy ski lodge-style setting, with plenty of picture windows for gazing out of as you sip your coffee. The eggs benedict (including a Cuban variation with pulled pork on chorizo biscuits) offerings are recommended, as is the aptly named Big Breakfast: three eggs, three strips of bacon, two sausage links, hand-cut breakfast potatoes, and an English muffin. 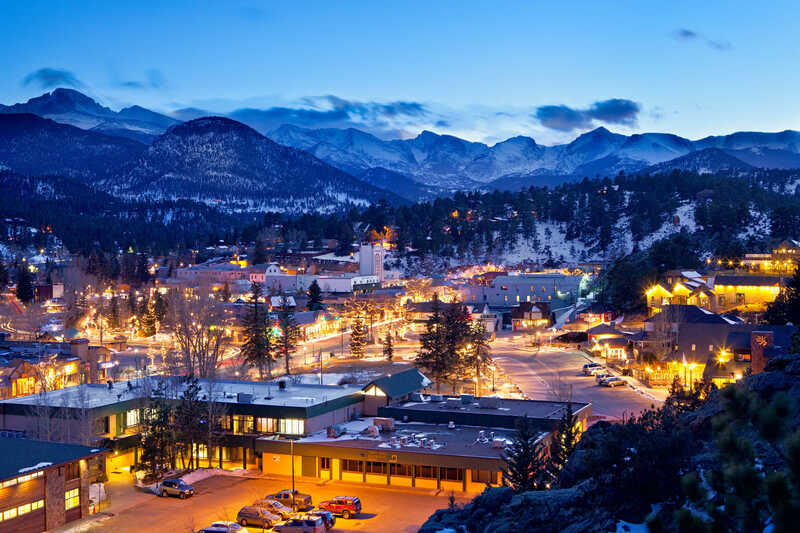 The heart of Estes Park is along Elkhorn Drive, which is lined with numerous locally owned shops and restaurants. There’s a definite frozen-in-time quality vibe happening here, with vintage Main Street Americana dominating – saltwater taffy anyone? But there are also hints of a new, hipper Estes Park emerging. Inkwell & Brew is a two-in-one shop, with cappuccino, cortado and pour-over and cold-brewed coffee blending with a lovely selection of letter-pressed cards, handmade fountain pens, and cute journals. Next door, browse the stacks at MacDonald Bookshop, located in a rustic cabin built all the way back in 1928, and proudly independent. Haven’t you heard – vinyl’s back! Check out the selection at Sgt. Pepper’s Music & Video. Yep, they’ve got The Beatles. Stop in for fresh and fast Mexican food for all at Pepper’s Mexican Grill. Build your own burritos, create your own entrées, or choose from a selection of local favorites including Buffalo Nachos and the Verde Smothered Burrito. Stop in and fuel up with warming menu options. Looming over Estes Park from an appropriately majestic perch, The Stanley is one of Colorado’s grand dame hotels. Listed on the National Register of Historic Places, it was completed in 1909 as a private mountain getaway for F.O. Stanley (inventor of the Stanley Steamer) and friends. Renovated in recent years, its old world architecture transports visitors back in time. The Stanley gained notoriety later in the 20th century as the inspiration behind Stephen King’s horror classic The Shining – and indeed, you can learn all about the various ghosts that are said to haunt the hotel to this day on an afternoon tour. Follow it up with spirits of another kind in the Cascades Whiskey Bar, home to some 1,000 expressions of whiskey, bourbon and scotch, one of the biggest collections in Colorado. You’ve been able to drink whiskey in Estes Park for some time now. But you haven’t been able to distill it within the city limits – until just a few years ago. Elkins Distilling, just opened in 2016, is the town’s first legal distillery (owing to the fact that there were probably a few under-the-radar moonshiners up here through the decades). The offerings here are made with 80% Colorado corn (from the town of Nunn) and 20% fossil-free malted barley. And thanks to its location at the top of Colorado’s watershed, the water is as pure as it gets. 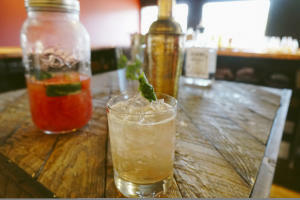 Spend a happy hour (or two) sipping in Elkins’ friendly tasting room, offering flights or very tasty craft cocktails. End your busy Estes Park Saturday by joining the locals at the Rock Inn, a favorite watering hole / live music venue with deep roots. Built in 1937 as a dance hall for the Big Band Era, there are bands (usually of the acoustic variety) virtually every weekend evening, playing from 6 p.m. until the crowd thins out. Who wants donuts? Donut Haus is your best bet, with deliciously decadent creations, made fresh every day of the week. And beyond the ordinary, try some of the more outré selections, like the Cheesecake Roll, a lightly fried butter roll topped with fresh cheesecake and cinnamon. You may want to set the alarm – once the Haus sells out, they’re done for the day. 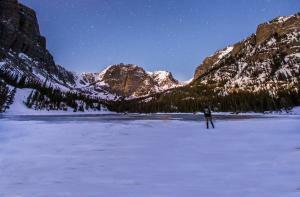 Head back into RMNP for a snowshoeing trek. Bear Lake is one of the park’s most iconic destinations – and it’s usually crowded in the summer. But winter is just the right spot for a dose of snowy sightseeing. 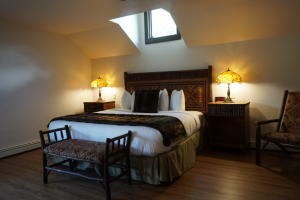 The Warming House is where you want to start. This long-running adventure outfitting shop offers gear rentals, tips on where to go and what to see, and much more. They also offer guided tours to hidden gems, frozen waterfalls, and breathtaking vistas. Bring the weekend to a fitting close by paying a visit to Rock Cut Brewing, one of Estes’ newest craft beer additions. Start with a pint of Altruism, a German-style Amber with a crispness that matches a winter afternoon perfectly. Pair it with wings and fried cauliflower from the Two Chicks food truck, which is usually parked right outside Rock Cut.